I'm a 29 year old mother of 4 kids under the age of 4, Kaden who will be 4 in april, Micah 19 months, and twins Taryn and Asher 3 months. My husband Shaun and I have been together for 11 years this summer and we've been married for 6 1/2. Having 4 kids in 3 1/2 years has made me some what of a recognizable figure at our local mall, hence the name "I'm the crazy lady with all the babies". Every time I go to the mall I hear "OMG, all they all yours?...God Bless you!" Here's a photo of all four kids. 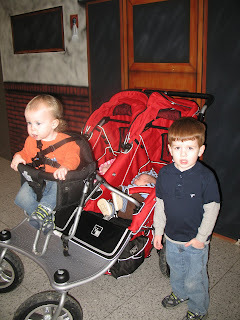 I'm sure the bright red stroller doesn't help with all the looks.